If you are looking for a more space-friendly home gym model, Bowflex Xceed and Bowflex PR3000 are some viable choices. These models have vertical platforms. As the effect, they don’t require as much surface area as those with horizontal platforms. 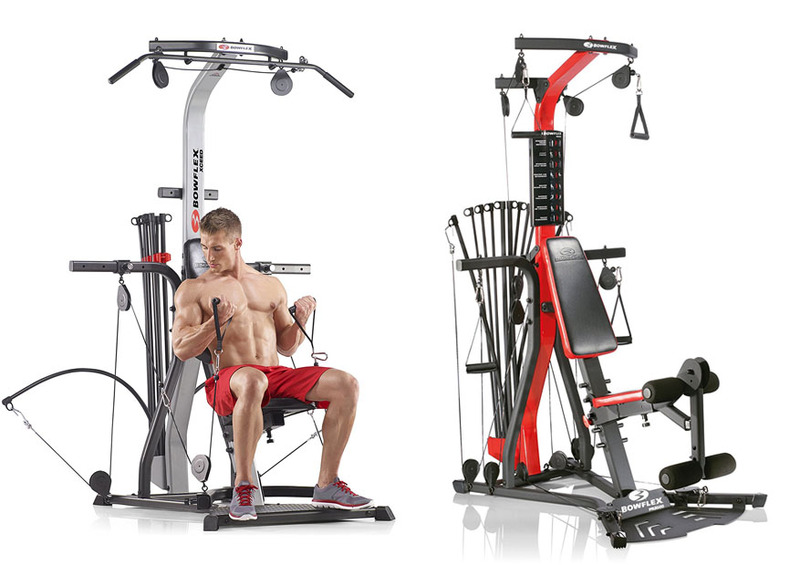 Both Bowflex Xceed and Bowflex PR3000 are also equipped with various built-in exercises to trains the arms, legs, shoulders, abs, chest, and back. So, what are the differences between Bowflex vs PR3000? Continue reading below to determine the best home gym model for you! Between these two home gym models, Bowflex Xceed is more compact. It measures 58” long and 49” wide, whereas the height is 83”. On the other hand, Bowflex PR3000 is quite larger, measuring 96” long, 78” wide, and 83” tall. So, if you really need the home gym to be as small as possible, Bowflex Xceed would be the more suitable option. But don’t forget that you still need some clearance on the sides of the home gym to allow the power rods to flex when used. You need about 100 inches from side to side to allow the power rods to expand without hitting something. See Bowflex Revolution vs Ultimate 2 if you prefer a home gym with a horizontal platform. Both Bowflex Xceed and Bowflex PR3000 are very rugged and durable. Their frames are thick and very sturdy. Don’t worry, even if you have a higher-than-average body weight, because these home gyms have a maximum user weight limit of 300 lbs (136 kg). Both Bowflex Xceed and Bowflex PR3000 work with the power rods to provide resistance. Each of the two models comes with 210-lbs progressive resistance, which is suitable for beginners. Both Bowflex Xceed and Bowflex PR3000 can be upgraded if you want to get higher resistance. However, Bowflex Xceed can be upgraded up to 410 lbs, whereas Bowflex PR3000 can only be upgraded to 310 lbs. So, if you plan to perform serious muscle training with higher resistance, Bowflex Xceed makes the better choice. The next difference of Bowflex Xceed vs PR3000 is the lat tower. Bowflex Xceed is equipped with a lat bar, which is a great choice to train your two arms evenly. The lat bar is also great for strengthening the upper back and shoulders. On the other hand, Bowflex PR3000 comes with individual high pulleys. You can also use these pulleys to train both arms, shoulders, and upper back. You can also use one of the pulleys to train a specific arm, for example your non-dominant arm. Bowflex Xceed has a total of 65 built-in exercises. There are the triple-function handgrip/ankle cuffs, abdominal crunch attachment, leg curl attachment, and squat station. On the other hand, Bowflex PR3000 only comes with a total of at least 50 built-in exercises, featuring the preacher curl attachment, gym-style abs attachment, and upholstered roller cushions for leg curl. BowflexXceed is the better choice because it comes with more built-in exercises and the power rods are upgradeable to 410 lbs. In addition, the size is also more compact. On the other hand, Bowflex PR3000 is also a nice home gym – the high pulleys are great – but the power rods can only be upgraded to 310 lbs, and it is also quite larger.